While I typically would describe myself more as “zapped” than “zappy,” I am excited that I made it to the end of this 26-day, 26-letter writing challenge. I set a goal and accomplished it. That in and of itself, feels pretty damn good! On the flip side, I’m sad to see the challenge come to end. I’ve found some pretty interesting blogs and fellow bloggers along the way that I’ll continue to follow. I like having a focus or theme to help guide my writing. Without this challenge I never would have written 26 posts in one month. While I know I can’t keep up this pace and market my new book and write my third book, I hope I can find time to write two or three posts a week. Writing is my outlet, whether anyone reads my words or not, I’m still going to spew them. 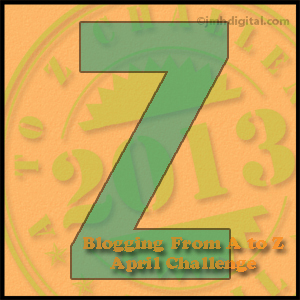 If anyone knows of any other blogging challenges I’d love to hear about them! I’ve found it easier this year than last – maybe because my book was published last April and there was a lot to do with launches and stuff. But still tiring, I’ve been sleeping in! Loved doing it though, because I like a deadline. Artificial ones, set by me, are no good at all! Thanks! I am so not good with self-imposed deadlines!